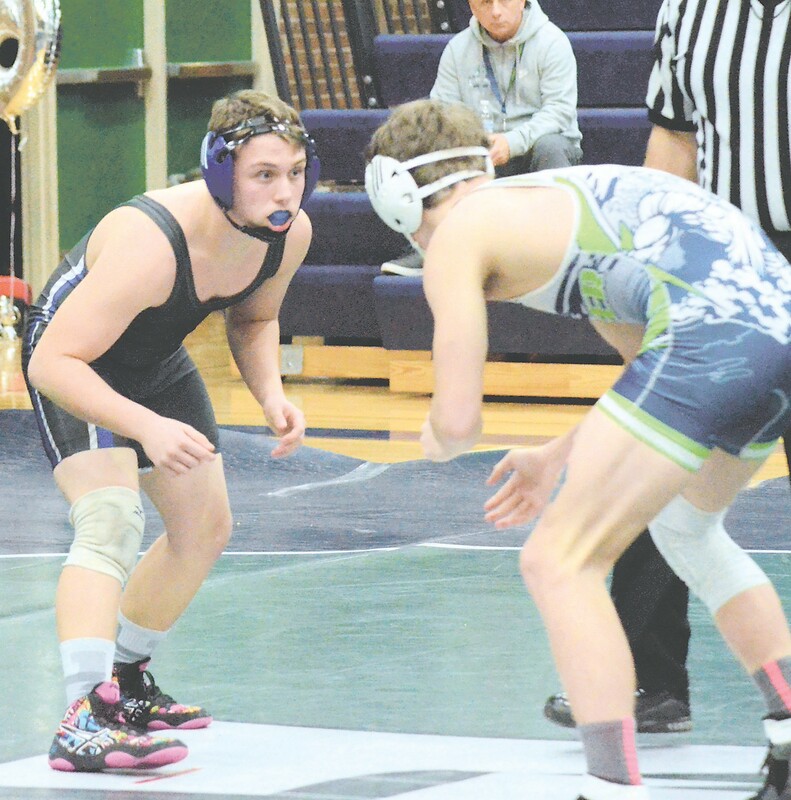 MIDLAND – The Carman- Ainsworth wrestling team had multiple wrestlers place within the top-five at the Saginaw Valley League tournament at Midland Dow last Saturday. As a team, Carman-Ainsworth finished 10th with a 61, while Davison was first with a 309.5, Grand Blanc second with 174.5 and Midland Dow third with 138.5. Mt. Pleasant finished fourth with 129, Saginaw Heritage fifth with 119, Bay City Western sixth with 110, Midland seventh with 104.5, Lapeer eighth with 79 and Bay City Central ninth with 75. Bay City John Glenn was 11th with 60, Flint was 12th with 39.5, Flint Powers Catholic 13th with 26 and Saginaw Arthur Hill 14th with 21. Individually, Trevon Bennett at 285 lbs. secured the Cavs’ top finish, placing second overall in his weight. Bennett began his tournament with a first-round bye before defeating Powers Catholic by a 13-0 major decision. In the semifinals, Bennett defeated Mt. Pleasant by a 6-1 decision to advance to the championship match, where he lost by fall to Bay City Western by a 1-0 decision to finish second. At 125, Larry Brown Jr. finished third overall and started his run with a bye in the first round. He then advanced to defeat Saginaw Arthur Hill by fall at :50 before losing to Grand Blanc by technical fall in the semifinal. Brown Jr. won his consolation semifinal match over Bay City Western by fall at 1:40 and then defeated Lapeer by an 11-5 decision in the third-place match to finish his day. Jacob Durbin at 152 finished fifth and began his day with a first-round bye. Durbin then lost to Saginaw Heritage by major decision before defeating Midland by a 6-2 decision in the third consolation round. In the consolation semifinal, Durbin lost by fall to Midland Dow, but he bounced back with a win by fall at 2:13 over Mt. Pleasant in the fifth-place match. At 171, Nathan Taylor also took home a fifth-place finish. Taylor defeated Powers by fall at 1:46 in the first round, but then lost to Grand Blanc by fall in the quarterfinal. In the second consolation round, Taylor defeated Bay City John Glenn by fall at :33 and followed that up with a win by fall at :47 over Bay City Central in the third consolation round. Taylor lost to Davison in the consolation semifinal by fall, but then won by rule over Lapeer in the fifth-place match. At 119, Omar Al Hallak received a bye in the first round and then lost to Mt. Pleasant in the quarterfinal by fall. He received another bye in the second consolation round before losing by decision to Arthur Hill in the third consolation round. David Mathis, at 185, lost his opening match by fall to Bay City Central before receiving a bye in the first consolation round. Mathis then lost by fall to Midland. At 215, Corban May drew a firstround bye, but then lost by fall to Midland Dow in the quarterfinal. May then received a bye in the second consolation round before losing to Bay City John Glenn in the third consolation round. Carman-Ainsworth competed in a quad at Whitmore Lake Wednesday after we went to press. — A.V. The Carman-Ainsworth bowling teams cruised to victories over Saginaw/ Saginaw Arthur Hill on Saturday at Stardust Lanes in Saginaw. The boys won 27-3 and the girls triumphed 28-2. Last Wednesday at Grand Blanc Lanes, the Cavs took down Grand Blanc, 15.5-14.5 on the boys’ end and 18-12 for the girls. Tyson Berry led the boys with a 225 and Tyler Willis bowled a 177. In the second game, Joey Wheeler was the leading Cavalier with 238. – B.P.